The Kester Wedding Bands honour the timeless and classical beauty of the baguette cut. Shown in 18k White Gold, with 3 Baguette Cut diamonds on each band, Total weight 0.9ct. 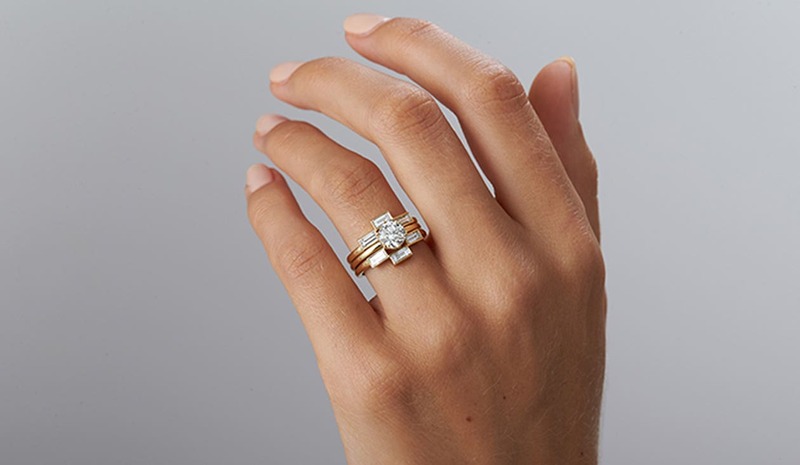 The Kester bands sit perfectly on either side of the Callida Engagement Ring. If you would like to learn more about this ring, please get in touch. The stepped design of the diamonds align perfectly around the Callida Engagement ring to enhance the solitaire diamond. We can alter this design to suit you, choose from Platinum, Yellow, White or Rose Gold. We like nothing better than working with you to create something truly special. Diamonds are measured in terms of weight not size, ‘Carat’ is the weight measurement of a precious stone, with one metric carat equalling to one fifth of a gram. Gem cutters will always analyse a diamond in its rough form and try to make sure they cut stones that retain the most carat weight. Two diamonds of equal weight can still end up with different value, as the quality is determined by, colour, clarity and cut. Diamond cutting began when Indian craftsmen found that by grinding diamonds together, they could create new depths of light and shimmering reflections. When we refer to colour, we are referring to the diamond colour grading scale. D-F are the most desired colours, with D being colourless, and going down the scale to a light yellow. Clarity is an indication of a diamonds purity. Inclusions are the internal characteristics of a diamond. They are what makes each stone unique and special to the wearer. They tend to be clear, white or black and can be in the form of pinpoints or clouds. It should be noted that most flaws are not visible to the untrained eye. Choose from our collection or collaborate with us to create a unique ring for your lifelong love. We like nothing better than working with you to create something truly special. Zoe and Morgan jewellery is handmade with care and we know you’re going to want to keep it looking great. So here are some tips to help you do just that. Diamonds are some of the hardest members of the jewellery crew - but don’t be fooled by all you hear. As tough as they are, these guys can still be chipped and shattered. Watch out when you are doing rough activities and don’t let these beauties anywhere near bleach. Check your jewellery settings regularly to ensure your diamonds are still secure. You can soak diamonds overnight in a very diluted formula of an eco glass cleaner, then give them a little brush with a really soft toothbrush. Shine them up with a lint free cloth and they are ready to sparkle again. "These rings have a special symbolic meaning: one is an octagon, one a hexagon. The eight sides of the octagon represent infinity and the hexagon among many meanings represents communication, balance, love, sincerity, truth, and equality. Both of these shapes are constructed from equal parts. This mirrors the underlying meaning of a perfect soulful union. May these rings remind you of your vows to each other. Choosing and discussing our rings with Zoe was one of the most fun parts of putting our wedding together. We loved talking through the designs in terms of shape visually and what they would represent to us. Zoe and the team were always so warm, kind and excited for us, making us feel at home as soon as we stepped in the door. Thank you so much!" I was daydreaming and came across this from our friends at Zoe and Morgan .